This is the first part of the Concurrency series in which I explore performance of various locking mechanisms. Once working on a pet project I started wondering how fast is a system wide lock in Windows so I decided to run few simple “benchmarks” just to get the general idea. The benchmarks are deliberately done this way so I can compare different languages in the same manner. Do not take results for granted, do not consider them reliable. First I explore WinAPI Mutex called from C#. Nothing special, just a named mutex and stopwatch. I try to measure the time to acquire mutex 100 thousand times. 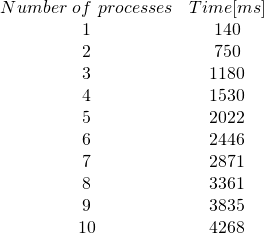 As we can see, to acquire mutex given number of times with 10 processes trying to do that concurrently we need over 4 seconds which gives 0.04 ms for single acquire + release. In next parts we will see different mechanisms, their performance and quirks.